It's that time of year when the leaves begin to pop out from branched buds to wave a welcome as you approach. Shy bulb flowers start to show their faces. I love the way you arrive in a cloud of blossom, bearing armfuls of colourful flowers and a warm sunny smile. Your friends, the birds and butterflies, are always close on your heels and soon it's one big happy party complete with lively bird song and heavenly scented breezes. Even the sun stays up later and later to join in the fun. Dear Spring, I'm so happy that you've come to visit us again. Happy Spring Day! I'm also celebrating today that Spring has finally arrived in the Southern Hemisphere! We've had such a cold wet winter this year. 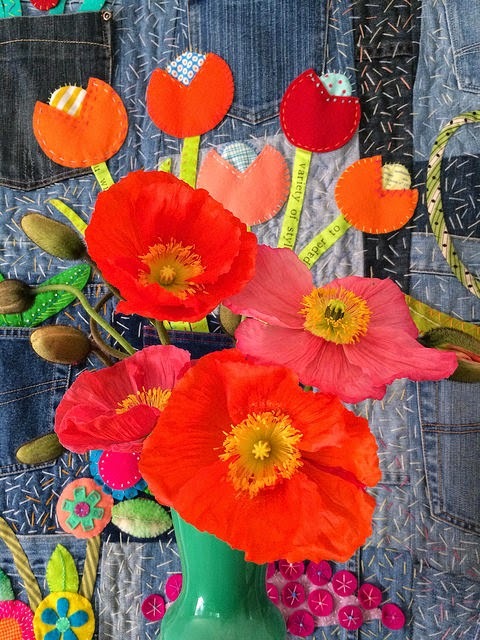 I love your applique flowers! Joyful! Wasn't it a beautiful day today! Everything is coming up roses as they say. Great time of the year for gardening AND sewing. Those pretty flowers are so beautiful! 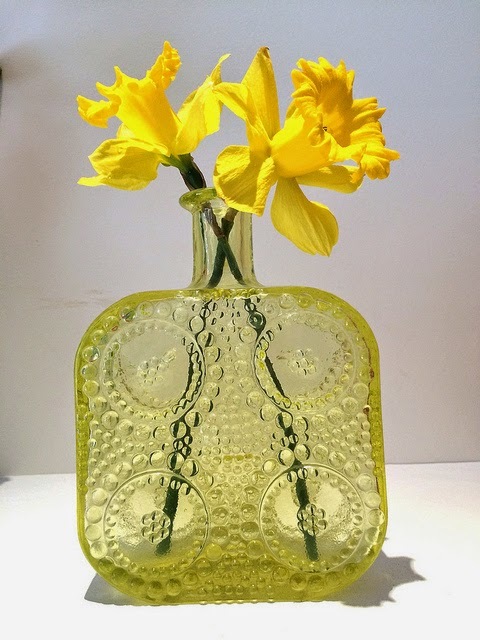 And that gorgeous yellow vase! OMG! Happy Spring to you, such beautiful bright happy colours. Aren't poppies a most beautiful flower. 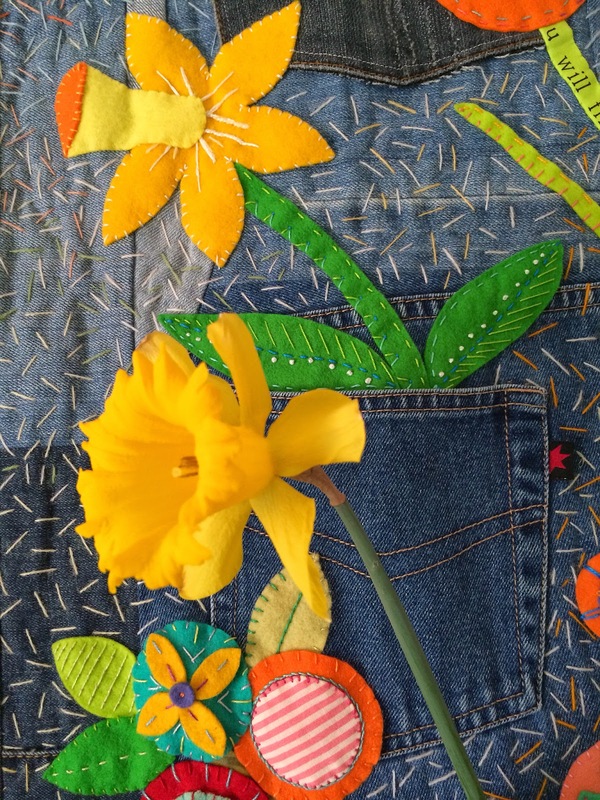 I love the daffodils with your pocketful of posies quilt. Beautiful spring day today and forecast for tomorrow back to cold and windy. Gorgeous fun post Rachael. Spring is very welcome here too! I LOVE Spring and your beautiful flowers, dear Rachael!! Beautiful flowers. Beautiful words. And beautiful quilt! I love Spring and all that it brings. I am so ready for some warm days! Very fun! I sure miss daffodils! Happy Spring to you! We are just getting ready for Fall and i am looking forward to it! You take the prettiest pictures. You could be a stylist for a magazine! It's nice to see spring popping over there, as autumn turns here. Your posts always make me smile! All of your stitching & flowers are gorgeous! As we are suppose to be heading into fall--we are having one heck of a heat wave here. Happy Spring to You!!! Happy Spring! Thanks for sharing those gorgeous flower photos. 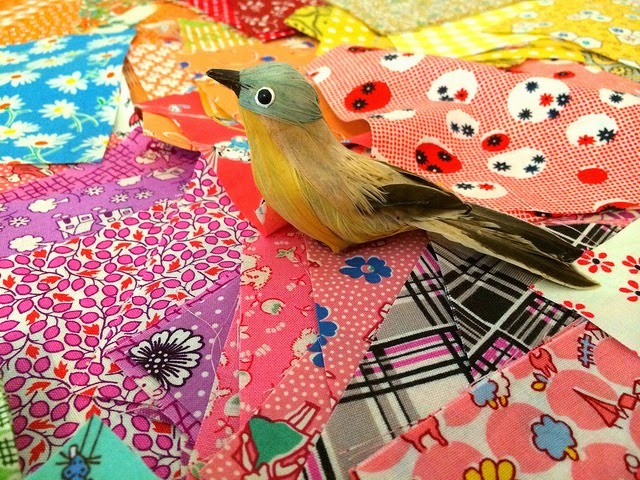 Your quilts are always as colorful as those beautiful spring flowers. Im loving seeing flowers start to shyly pop up their heads . I even have a few tulips that have bloomed. Your happy spring makes our fall happy!! As always, I wish you were just next door. (Though if you were, you would be wishing for autumn rather than spring.) My dear florist, your flower posts are always a joy! Welcome to spring! What a delightful way to begin. 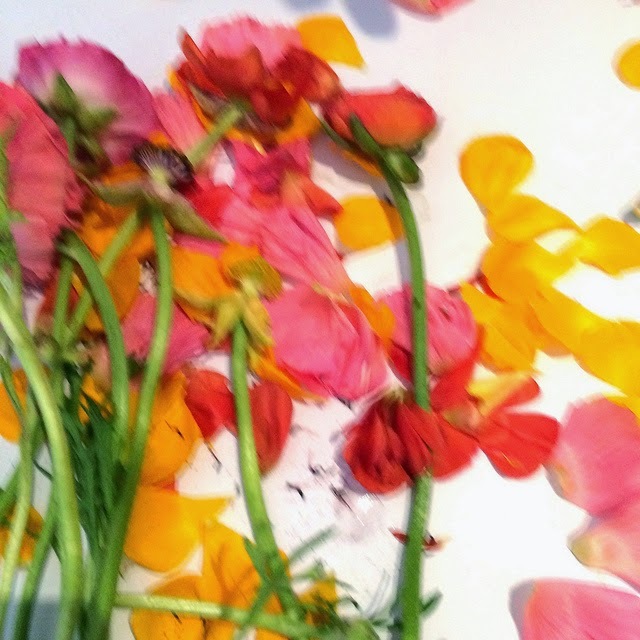 The flowers in front of pocketful of posies are my absolute favourite pic in the post. 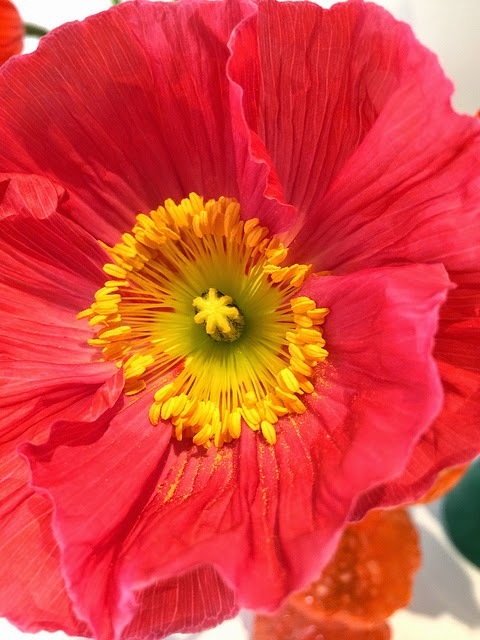 We have an early scarlet poppy (just one)blooming at the moment. Our dear girl gravely inspects it. We have also just got spring chickens - 3 girls, Drusilla, Cassandra and Hetty Feather! Yay Spring. It was a fabulous day for the start of spring. I wish I could grow spring flowers here, sigh! Particularly love that first pic, the one of the poppy! It is just right! Ranuncs and poppies are two of my fave flowers to photograph. Pity we are heading into winter here but that is how the cycle goes! No spring without winter! 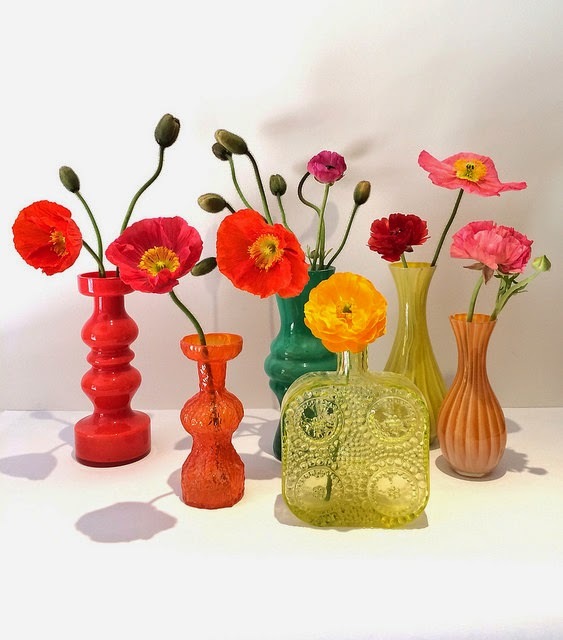 I adore your vase collection, they are just perfect with those bright flowers! It is so wonderful to be over the winter and right into Spring - we are madly gardening and preparing for Summer now! yeah for spring and poppies!!! one of my very favorite flowers! What a beautiful post. Although looking out the window, it looks like Winter has made a swift and chilly return!! I love your poem (yes, it is a poem) and captures the feeling and longing of spring perfectly. There is nothing like it after a long dark winter. enjoy the flowers, birds and breezes. It's so strange to me that, as your welcoming spring, we are anticipating fall and winter. Happy Spring my Aussie friend ! 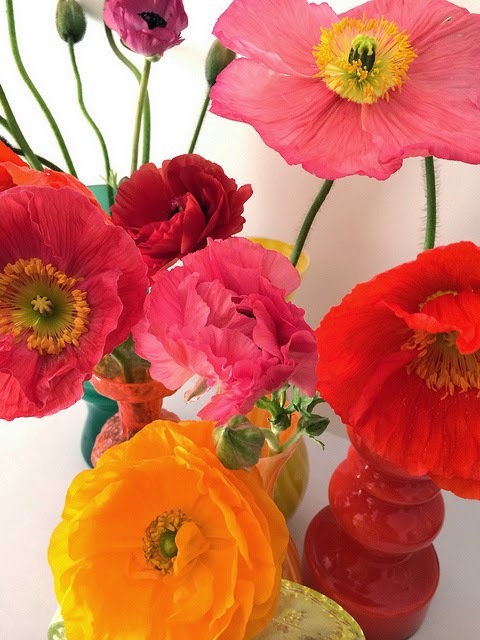 Happy Spring to you , beautiful flowers and colors! very inspiring. me, I am looking forward to fall and all the beautiful colors that happens to our trees. My favorite time of the year, yes I am inspired by fall colors in my quilting…. I love the vases especially that yellow one, wow! I'm looking forward to the Autumn equinox on September 23 here in Canada. These last few days of Summer have been lovely, we have a bit of rain today and a bit more of Autumn temperatures. I'm curious why you are saying it is the first day of Spring in Australia? Hi Sandi, in Australia our seasons begin with the beginning of the month, not by the equinoxes like some countries do. I'm not sure why it's different. Enjoy your spring, we are enjoying heading into fall. I prefer fall to winter for the color. Although the many shades of white in the mountain snows are pretty spectacular. It cracks me up when people think that "Natural" colors are BEIGE!!. I'm glad I found a house that is covered in Nature!! Such a bright, cheerful post. The start of spring is a lovely time of year. Let's hope the nice weather returns in the next few days, after this rude return to winter weather. These beautiful photos just completely started my day off with some cheer!